The Lost Puzzler was a puzzle, in more ways than one. Not only was the story shrouded in mystery, the plot was also slow to unravel, inviting the readers to seek the solution to the big question while doling out clues gradually in a teasing fashion. In addition, the structure of the book felt like a series of many separate and dissimilar segments making up a whole, thus making it feel very fractured. For obvious reasons, novels like this often present me with a conundrum: how to rate it when I enjoy some of its pieces but not the others? 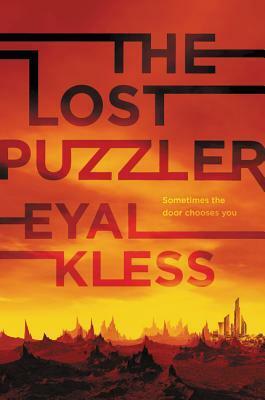 In the case of The Lost Puzzler, I loved everything about the first half. We begin the tale through the eyes of a lowly scribe of the Guild of Historians who has been tasked with a dangerous mission to discover the fate of a boy who disappeared more than a decade before. This boy—named Rafik—is said to be a Puzzler, an individual with a special talent to unlock mysterious puzzle box-like nodes that are scattered across the world, hidden away in labyrinths and other dungeon-like places, where they guard the valuable treasures of the lost Tarkanian civilization. Following an apocalyptic event known as the Catastrophe, those who survived have split into different groups, and one of these groups called the Salvationists believe that the answers lie in the ancient technology of their forebears. They send teams on dangerous expeditions to plunder Tarkanian strongholds, where the Puzzler will attempt to crack their defenses while the rest of the squad protects itself from threats like traps and attacking lizard-like creatures. Soon after the intro though, the narrative shifts to tell the story of Rafik. He was born in a community that has reverted to the old ways after the Catastrophe, becoming deeply faithful to the new gods they worship while shunning everything to do with technology. When the strange tattoos marking him as special began appearing on Rafik’s fingertips, his parents feared their son cursed, sending him away to a “friend” of the family who promised to get a good price for him at auction. Recognizing his value, a powerful guild ends up purchasing Rafik at a high price, nearly bankrupting themselves in the process. To ensure a return on their investment, Rafik’s new handlers begin grooming him for the demanding role of Puzzler, putting him through rigorous training exercises to prepare him for his first expedition. The book flips the reader back and forth between these two timelines—the one in the present, where our historian attempts to extract Rafik’s story from a woman who used to know him, and the one in the past, which flashes back to her knowledge of the boy’s history and her recollections of her time with him. The awkward transitions notwithstanding, I generally liked how the two narratives were presented, especially the way they framed Rafik’s backstory while doing an excellent job filling in the lore and background of the setting. Like I said, I loved the first half of the book, particularly the parts detailing the initial stages of Rafik’s exile, from the time he discovered the telltale markings on his hand to the harrowing journey on the road where he is traded from master to master. Not surprisingly, some of my favorite moments from the book came from these early segments, with Rafik’s time with the charismatic Captain Sam and his supertruck Sweetheart immediately coming to mind. The problem, however, is that many of these fascinating encounters are much too short. While I really enjoyed Rafik’s backstory, I wasn’t so much a fan of the episodic nature of his narrative. It felt really fragmented, with his character being passed like a hockey puck from one situation to the next, not to mention how a lot of the entertaining side characters end up sticking around just long enough to endear themselves to the reader before they are swiftly left behind and never to be seen again. It seemed a little wasteful, in a way, how many of the incredible characters and concepts presented here were never explored to their full potential. It made me think that much of Rafik’s backstory of his time before being sold to the Salvationist guild could have been cut down or reworked because of the way it plodded and meandered. The novel also started losing me in its second half. After Rafik is bought by the guild, the story descends into a confusion of ideas that remind me of a bit of a fantasy RPG campaign mixed with the premise of a YA dystopian like The Maze Runner. These elements didn’t mesh as well with the rest of the world-building. I also didn’t feel as invested in the story once the present timeline took over for good. And while the conclusion provided some answers, the explanations given were convoluted and I didn’t find them particularly helpful, especially since they led to even more questions. All of this led to my mixed opinions on the The Lost Puzzler. At times, it was a compelling page-turner where all I wanted was to know more about the life of Rafik and his abilities; other times, I was uncertain how I felt about the story’s direction and disjointed sections. That said, on the whole I found this to be an entertaining read and a fairly solid debut, and at this point I’m up for giving this world another go if there is a sequel. It sounds like you at least found potential in amongst the issues it had. Maybe the next book will iron out the problems and be really good. I had my eye on this one but I have to admit, it sounds a tad slow for me. Think I’ll hold off on it for a while. I’ve got others I’d rather get to and to be honest, I’m kind of hit or miss with dystopian reads. I’m the same way with dystopian reads. This wasn’t bad, but I think I expected more. One of my pet peeves is side characters who don’t have a real purpose in the story. Like you said, it feels like a waste of time. But I sure like the idea! Yeah, I’m usually a hard sell with dual timelines, so I think I ran into some of those issues here. A little bit too complicated, perhaps. You might be remembering right. I think the UK/EU version might have a different cover. Yeah, and you know how I am with nonlinear stories 😀 They can be hit or miss, and like you said they need to be handled very carefully. I guess I wasn’t completely sold with this one. Hmm, that’s interesting. I love puzzles, but I think I would maybe get frustrated with this one. I’ve not read any dystopia for a while but I think I’m probably on the fence with this one.